Despite success in the toy market, Nintendo president Hiroshi Yamauchi believed that the self-imposed regulations by the market was throttling Nintendo's profits. He sought to branch out into the electronic gaming market that was emerging in the United States, with Atari's Pong arcade machine and the Magnavox Odyssey home videogame system. Nintendo received a license from Magnavox to design and manufacture their own Nintendo-branded systems based on the Odyssey's light tennis game. Teaming up with Mitsubishi, and with assistance from Sharp employees, Nintendo created the Color TV-Game 6, their first home videogame system. 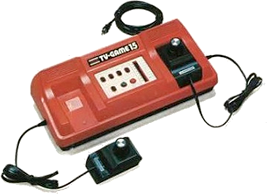 A total of five Color TV-Game systems were released in Japan between 1977 and 1980. Each was a standalone unit that played a single game, with variations on each provided by changing the switches on the base unit.